Olympics Committee President Jacques Rogge has rejected calls for a special observance to commemorate the 40th anniversary of the murder of 11 Israeli athletes and coaches by Palestinian gunmen at the 1972 Munich Games. “We feel that the Opening Ceremony is an atmosphere that is not fit to remember such a tragic incident,” Jacques Rogge, president of the International Olympic Committee (IOC), said Saturday. 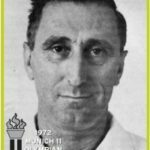 Israeli marksmanship coach Kehat Shorr was murdered by Palestinian terrorists at the 1972 Olympic Games in Munich. In 2000, the official newspaper of Yasir Arafat’s Palestinian Authority urged Arab regimes to boycott this summer’s Olympic Games in Australia, because there was to be a moment of silence at the start of the games in memory of the 11 Israeli athletes murdered by Arafat’s PLO terrorists at the 1972 Munich Olympics. Many believe the Olympic Committee fears Arab boycotts or worse. Read about the murder of the Israeli athletes at the link above. Why should the Olympics Committee hold a moment of silence for the murdered athletes and coaches at the opening ceremonies?